This ultra-low power, processing-efficient system enables OEMs to extend battery life while designing in sophisticated, always-on sensing capabilities on mobile devices. 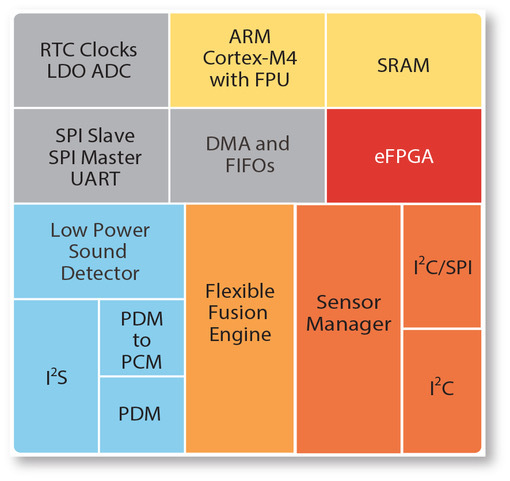 Advanced sensor algorithms such as voice triggering, motion compensated heart rate monitoring, and indoor navigation can be achieved at significant power reduction compared to competing MCU-based solutions. Unlike traditional MCU-based solutions, the EOS S3 is a multi-core, sensor processing system that enables sophisticated algorithm partitioning to facilitate the lowest possible power consumption for the designated task. The EOS S3 employs not only fundamental, but also very sophisticated, always-on, context-aware sensing capabilities while staying well within the strict power budgets of smartphone, wearable, and IoT designs.